I had the good fortune to attend a watch party for the Willow Creek Global Leadership Summit a few weeks ago. I’ve always enjoyed learning about leadership, especially because it often seems that the business world has such a jacked up view of what leadership should look like: Dress in power suits and power colors. Take charge. Take the floor. Put yourself in the spotlight. Micromanage your team to make sure the job gets done. Etc, etc, etc. If you haven’t heard these “leadership” tips, then you’ve surely heard others. That’s why I love learning from people who have different approaches to leadership. And yes, there are many different styles of effective leadership out there. Perhaps even a unique style for each individual leader. “The harder the problem, the softer you need to be on the person.” Listen, put yourself in the person’s shoes, and respect. Work together to come up with creative solutions that meet all parties’ needs. Ask the person “Why is that?” and ask them to help you understand their interests in the situation. Fanatic Discipline: Collins says the most successful organizations in the long term are those that make consistent progress, no matter the conditions. He calls this concept the 20-mile march. Rain or snow or sunny weather, these organizations have the discipline not to run too far too fast in the good times and not to run too little too slowly during the bad times. “Chronic inconsistency is the signature of mediocrity,” he says. Productive Paranoia: The great organizations are fanatic about being prepared. During the good times, they prepare for the bad. They’re never caught by surprise. “Introverts typically prefer to work independently, and solitude can be a catalyst to innovation.” The Groupthink environment that came into fashion in the ’90s (think teams, open work spaces, small group learning in schools) provides non-stop stimulation. Introverts often work best when given room for “Deliberate Practice,” Anders Ericsson’s phrase for identifying “tasks or knowledge that are just out of your reach, [striving] to upgrade your performance,[ monitoring] your progress, and [revising] accordingly.” Ericsson says this process works best when an individual can focus on the exact piece of the process that is most challenging to him or her, not what’s challenging to a team or group as a whole. I’m having a hard time narrowing down my thoughts on Good to Great by Jim Collins. To be honest, each of the six sections of the book could comprise its own post. In this book, Collins, who also wrote Built to Last, sets out to study how companies could achieve enduring greatness. In the process, his research team uncovers 11 companies that made the jump from good (or even mediocre or bad) to great. They then interview executives from these 11 companies to try to tease out similarities that contributed to their greatness. The six concepts fall into three categories: disciplined people, disciplined thought and disciplines action. I’ll limit myself to comments on two of these concepts. 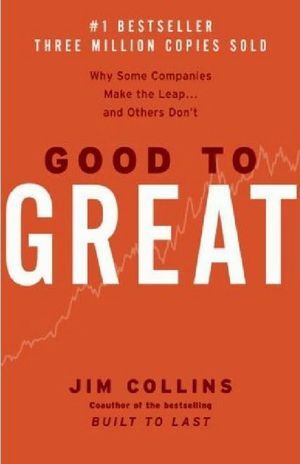 The good to great companies “first got the right people on the bus (and the wrong people off the bus) and then figured out where to drive it.” Moreover, Collins observes that “the right people don’t need to be tightly managed or fired up; they will be self-motivated by the inner drive to produce the best results and to be part of creating something great.” When you think about it, this approach makes a lot of sense. If you have the right team of adaptable individuals working together, then you have a lot of freedom to remain nimble and change direction as needed. This piece is all about determining a core idea that unites your team’s passion, your team’s unique expertise and determining your company’s ultimate economic denominator. It’s the core idea that drives the business. It can be extremely simple. Collins notes that determining the Hedgehog Concept can be an iterative process that takes time. On average, he says, the 11 good to great companies took four years to find theirs. Finally, once you uncover your Hedgehog Concept, you reach the hardest part — sticking to it, even when flashier ideas pass by. Does either of these concepts ring true to you? How have you seen them play out? 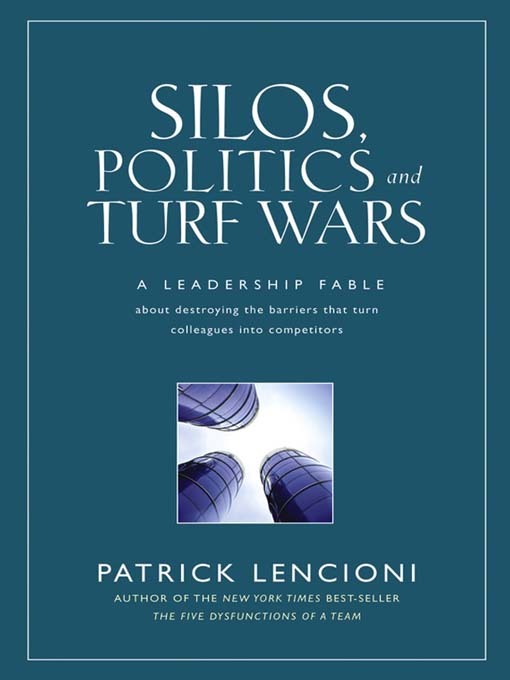 Even though I heard Patrick Lencioni speak at the Willow Creek Leadership Summit last fall and was very impressed by him, I didn’t put two and two together when I first started reading his newest book, Silos, Politics and Turf Wars, for a campus book discussion. It wasn’t until I opened up the back cover that I thought Hey, I recognize this guy. At that point, I knew it was going to be a worthwhile read. In Silos, Politics and Turf Wars, Lencioni spends 170 pages building a narrative that draws the reader in and frames his argument. Fictional character Jude leaves his job at a large corporation and sets out to make it as a consultant. His first handful of clients is a diverse bunch, and it’s crucial that he quickly figure out what it is that he can contribute to their unique business environments. You’ll have to read the book to find out the rest of the narrative! His model for addressing silos is to rally the leadership team around a thematic goal and several sub-objectives over a fairly short period of time – anywhere from a month for a startup company to a year in an academic environment. Although one person on the leadership team may be more familiar with a particular sub-objective, it’s the entire leadership team’s responsibility to accomplish the thematic goal. Each leadership team member must carry the thematic goal battle cry back to his or her unit so that the entire organization moves toward the shared goal together. “The thematic goal is not a number, and it is not even specifically measurable. It is a general statement of a desired accomplishment. It requires a verb, because it rallies people to do something. Improve, reduce, increase, grow, change, establish, eliminate, accelerate,” he writes. This book is a must-read for anyone in a leadership position. Even if your work environment isn’t a Microsoft or a Google, most medium and large organizations – and even some small ones – contain silos and would be wise to test and adopt Lencioni’s approach.